The priest isn't a saint but a sinner. He knows that too well. "Yes. Perhaps you are right. You see I am a bad priest and a bad man. To die in a state of mortal sin"—he [the priest] gave an uneasy chuckle—"it makes you think." People calling him "Father" reminds him of his guilt. He has been drinking too much. He has lied. He has fathered a love-child. Her name: Brigitta. He has seen her when he visited the town of Concepcion. He'd rather be damned in hell if that means saving his daughter from harm. The Power and the Glory by Graham Greene is a very personal novel, in that it relates the struggles of a priest who wants to remain faithful to his calling but is daily confronted by his past. The Roman Catholic priesthood is largely misunderstood; here Greene gives it a human face—the good and the bad included. The novel is an exploration of the ills of a Marxist society and is a narrative of what happens to a community when religion is outlawed. It exposes the ills of the Roman Catholic church and is so reminiscent of Noli and Fili. 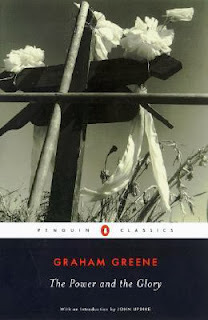 This book is not theological, although it touches on theological subjects—faith, mercy, forgiveness, and penance—themes very close to Graham Greene's heart, a Catholic himself. And one must not use the novel for doctrinal studies. Needless to say, I do not believe the Sacrament of Penance, where the sinner recites his confession to a priest instead of directly asking God for forgiveness—for isn't it true that Jesus Christ is our great high priest in heaven and we can come to Him directly? The final paragraph shows that after all the priest had gone through he remains uncertain of his eternal future. Had he entirely relied on the grace of God and not on his own works, he would've been in a much better place. Such is the tragedy of relying on one's self-righteousness—one can never be too sure if one's "holiness" is enough to enter heaven's doors. Graham Greene's novel is a compelling page-turner, one that will go down as one of my favorite books of all time.